Wilson Audio Specialties WATT/Puppy 7 loudspeaker is mans best friend. All right, at $22,400 USD per pair, lets make that an audiophiles best friend, a relationship I shall attempt to establish in a professionally disinterested fashion. I begin blandly enough by stating that two Wilson Audio WATT/Puppy 7s now stand exactly where once stood my two WATT/Puppy 6es, emphasis on exactly: The 7s floor spikes fill the holes poked by my 6es. From the start, Wilson has used composites rather than wood, or the near-ubiquitous fiberboard, in its pursuit of speaker-cabinet inertia. Rapping on a WATT or Puppy of any generation is hard on the knuckles. Appearance-wise, the WATT 6 and 7 are about indistinguishable; the Puppy 7 differs from its predecessor only in its left and right side walls (wings). Both 6 and 7 offer four choices of lift to adjust for the WATTs phase alignment, relative to the distances of oneself from the speakers and ones ears from the floor. The 7s wings, slightly taller toward the rear, better conceal the backside gap between Puppy and WATT. Purely cosmetic. 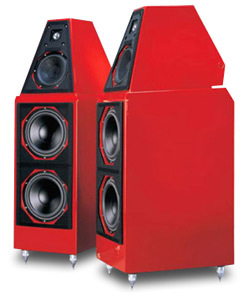 According to Wilson Audio, Scan-Speak in Denmark manufactures to Wilson specs the 7s midrange driver and woofer. The Puppy 7s new woofer is said to provide flatter response, speedier transients, and somewhat deeper extension (more about this below). The WATT 7s Focal tweeter is modified by Wilson in Provo, Utah, mainly by the addition of a sealed enclosure behind the tweeter-motor structure. As for the WATT 7s new formulation, in typically Wilsonian tight-lipped fashion, the promotional prose identifies the composites only as X and M: "Distortion, noise, and audible . . . resonance are all substantially reduced." The crossover, too, has been modified, but sealed as it is like a bug in amber, any improvements remain undisclosed. In a phone chat I had with Dave Wilson, I asked whether hed be better off designing and manufacturing all his own parts. His answer was intriguing. Wilsons company is certainly doing enough business to afford the expense of tooling up. However, once a designer-manufacturer has committed resources to an in-house component, hes reluctant, for obvious reasons, to give it up any time soon, whatever the temptation. For example, what if a driver manufacturer develops a product that Wilson thinks would be ideal for a Wilson system -- better, indeed, than his hypothetical own, into which hes sunk a hypothetical bundle? In the long run, its more cost-effective and less stressful to have a quality OEM manufacturer modify an already well-executed driver to Wilsons specific needs; or, as with the WATT 7s Focal tweeter, have it modified at the Wilson factory. I asked Dave Wilson about his cryptically named enclosure materials. Composition X, first used in the X-1 Grand SLAMM, consists of a "very hard" phenolic resin and mineral mix -- and, I suspect, a dollop or two of other stuff. The more recently developed composition M, "harder than the best MDF" but softer than composition X, contains "wood fiber and other organic materials" (eye of newt, toe of frog, wool of bat, and tongue of dog?). M surpasses X at "settling resonances in the midrange." It also does better at coupling driver frames to enclosures. Apart from a reviewers bloviations about the discs he played, nothing is as tiresome as the parroting of a manufacturers information -- not that Ive ever had occasion to doubt or question a Wilson claim. Conversely, nothings as stimulating to a writer as attempting to describe what he hears a speaker doing, for better or ill -- stimulating and challenging. Lets remember that the WATT/Puppy 6 is one peach of a system. (I choose is over was in deference to those who may be looking to score a pair. The speaker still exists, and its not likely to decompose.) The 6, as mentioned, is a step up from the 5. The WATTs geometry hasnt changed since its inception, though its drivers, crossovers, and enclosure components certainly have. Dave Wilson conceived the WATT (Wilson Audio Tiny Tot) as a portable recording-session monitor. After a few less-than-ideal stabs at the WATTs domestication, Wilson introduced the Puppy as the weighty little brutes domicile-friendly perch and low-frequency companion piece, which is how the system has long been marketed. However, my first experience of the WATT antedates the Puppys introduction. Audio writer Michael Gindi had a pair in his home. I dont recall what kind of pedestal they occupied, but I do remember the "beard," a Wilson-crafted apron. Its purpose, I believe, was to smooth and extend the WATTs low end, such as it was. Honest-to-God woofers dwelt elsewhere in the room. I wasnt much taken by that early WATTs sound, but was definitely impressed with the detail and dimensions of the soundfield it cast, reluctant as I was to admit it. Dr. Gindi and I hit it off like butter in a hot skillet and wound up exchanging several published unpleasantries. Trivia buffs can find them in the moldering pages of ancient issues of Fanfare. Before I was demoted to record reviewer, I contributed a column, "Random Noise," where, among other scattershot activities, I did verbal battle with what Ive since become: a carefree, to-hell-with-double-blind-testing subjectivist. I learned early in the game that you can say what you please about music without risking riptides of ire. But poke fun at high-distortion tubed electronics? Burning the flag is nothing by comparison. When it comes to fundamentalist zealotry, I wish I could afford the luxury of contempt. At the time of lAffaire Gindi, I was one of Roy Allisons acolytes -- or, more precisely, much influenced by a strict, numbers-tell-the-story objectivist for whom the sun rose and set on his audio hero. I mention this only because Allison designed and manufactured his own drivers. Anyone who did otherwise was a mere "enclosure stuffer." The well-reviewed Allison Model One remained unchanged for better than a dozen years. With that time scale perhaps in mind, my guru expressed contempt for audio designers who brought modifications to market more speedily than seemed fitting. "Why cant they get it right the first time?" Its a fair question, but frequently its the wrong question. If something initially good can in time be improved on, should it be? Obviously, yes. With respect to my having lived with three WATT/Puppy iterations, the successors to the excellent Series 5 represent good, valid advances. Nor is it a matter of apples and oranges: the Series 7 is very much a WATT/Puppy. As mentioned, the 7s woofers are new. However, to return to my conversation with Dave Wilson, extensive work on the crossover accounts in larger measure for the differences between Puppys 6 and 7. I tried a few organ recordings, and the low-end extension impressed me as rather more than slight. Those long, lovely pipes communicated their punch with greater authority than Id heard in my room, which, in fairness, is not quite what it was when the 6es were here. The spaces five windows -- two facing the street, three comprising a large bay to the left of the sweet spot -- have been changed. Milady and I decided to replace largely inoperable antiques, along with their ill-fitting storm windows, with double-glazed vinyls. The new windows are great at masking street-traffic noise, and, more to our purpose, they imitate a wall a lot better than the old windows did. Its no secret that windows can degrade a sound systems low end. Otherwise, nothing in the room has changed. Had I assessed the 6 and 7 under identical conditions, Ive the feeling Id still be impressed by the 7s bass, which sounded to me smoother and deeper. I also think it integrates better with the WATT. As coherent a system as the 6 is, the 7s seamlessness was more impressive yet. All my WATT/Puppys have been bears for resolution, permitting me to detect the subtlest differences among recordings. Their character has been that of the production. As with its low end, the 7 seems to do even better in this regard. I suspect that what I was responding to was superior coherence not only between its upper and lower units, but within the WATT itself. Early in my listening sessions -- before the system ought to have been broken in -- I remarked the 7s openness. Did crossover modifications account for what I was hearing, or was it as much a matter of the WATTs enclosure formulation? Its fun to speculate, but it was even more fun to listen to the music filling the room. The Series 7s rather astonishing transparency could not be denied. And Im sorry, but theres no way to express my admiration without discussing a few recordings. But first . . .
For the purpose of these comments, I did not install the Walker UHD Links I had at the WATT 6es binding posts. The speaker cables and interconnects, which Ill be reporting on presently, are Audio Magic Clairvoyants. The CD player is the Mark Levinson No.390S, an upgrade of the No.39. The mono amps are ML No.33Hs. My Reimyo line conditioner, connected to which are two Harmonix Studio Master power cords, incorporates Quantums QRT technology. A Quantum Symphony and Quantum Symphony Pro are also in operation. The electronic components sit on SRA platforms, and my sound system takes its power from four dedicated 20A lines with FIM 880 outlets. Morton Feldman and the FLUX Quartets String Quartet No.2 [Mode 112] consist of a five-CD, six-hour-plus performance. Thats right: 6:07:07 of two violins, viola, and cello in a one-movement work. As in much of Feldmans music, events unfold sotto voce. The magic is in the simplicity of patterned understatement. We hear no heroic rhetoric from the cello, for example, thus nothing to remind one of the 7s glorious low midrange to midbass. Weve other delights to savor. Ive played these discs on the 6es and have been impressed by the intimacy of recording engineer David Walters fine detailing. The FLUXers are well served by a sensitive production. In starkest contrast was Helmut Lachenmanns opera (of sorts), Das M�dchen mit den Schwefelh�lzern [CD, Kairos 0012282KAI], based on Hans Christian Andersens The Little Match Girl. Lachenmann, an utterly committed, take-no-prisoners modernist (and a great favorite of mine), employs instruments in hugely unconventional, often unrecognizable ways. In the effects he applies to high-tension conceptions, hes Feldmans polar opposite. Suffice for these remarks that engineer Gerd Puchelts beautifully detailed recording ranges from the barely audible to the thunderous. In audiophile terms, were treated to the kitchen sink: keen-edged transients tick-tock soft to howitzer-loud, along with a vast assortment of description-defying sonorities in a spacious, lifelike soundfield. The 6 handled this handsomely, and the 7 just better enough, again in terms of resolution and transparency, to justify the difference. The 6 and 7 are siblings to the bone, the younger being better at what both do so well. Listening carefully to well-produced CDs has helped me understand what sets the WATT/Puppy 7 apart. I mention in my Feldman remarks a strong sense of texture. Bang on a Can is a New York new-music organization; their So Percussion [Cantaloupe CA21022] features music by Evan Ziporyn and David Lang. The middle track of Langs The So-Called Laws of Nature is scored for some kind of metallophones -- bars of brass or bronze perhaps, or struck bells (the insert provides scant information) -- and medium-deep drums. Wow. Gooseflesh. Hairs bristling on the back of the neck. The struck metals complexity -- its texture -- put me there. To my mind, nothing sets a good sound system apart so much as resolution. Any adequately powered rig can play loud, but with this much detail? Not likely. Finally (youve been very good), on an old (1987) all-digital CD, the human voice: soprano Pamela Coburn and baritone Hermann Prey singing Brahmss settings of German folksongs, accompanied by pianist Geoffrey Parsons (Helge J�rns, engineer [Capriccio 10 199]). Im reminded -- again -- that the silver discs detractors could more profitably have spent their time fertilizing crops. This is a beautiful release with, once more, that thrilling sense of texture, of both voices and piano. Lest you mistake the term to mean fulsome infusions of analytical purity (read: brittle and cold), understand that Im talking about the kind of humid fun that approaches voyeurism -- an observation that only an audiophile could possibly understand. It occurs to me that harping on a single quality -- texture -- might inadvertently convey the suggestion of coloration: that the WATT/Puppy 7 contributed a euphonious effect. Not so. Ive been hearing that delightful something extra only from notably good productions. Other productions, even those as remarkable as Ken Wilkinsons engineering of early stereo performances (such as Brahmss Symphony 2, with Fritz Reiner and the Royal Philharmonic [Chesky Gold Series CD CG906]), convey what my WATT/Puppys have always permitted me to hear: the limitations and distortions of the technology of its time (1962, in the case of this excellent reissue). The WATT/Puppy 7s resolution, transparency, micro- and macrodynamic capabilities, timbral accuracy, and soundfield projection are the best Ive lived with.